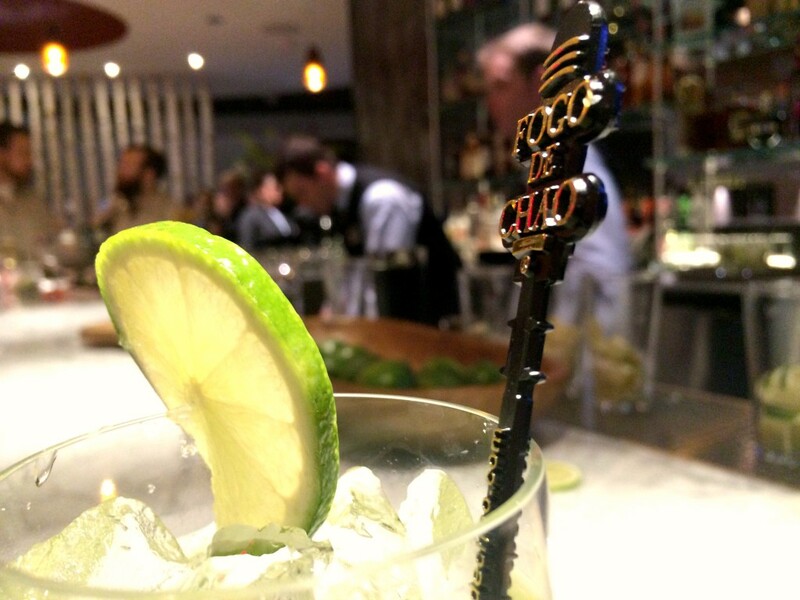 Roving chefs with skewers of meat and big knives make Fogo De Chao a fun place to celebrate in downtown Portland. 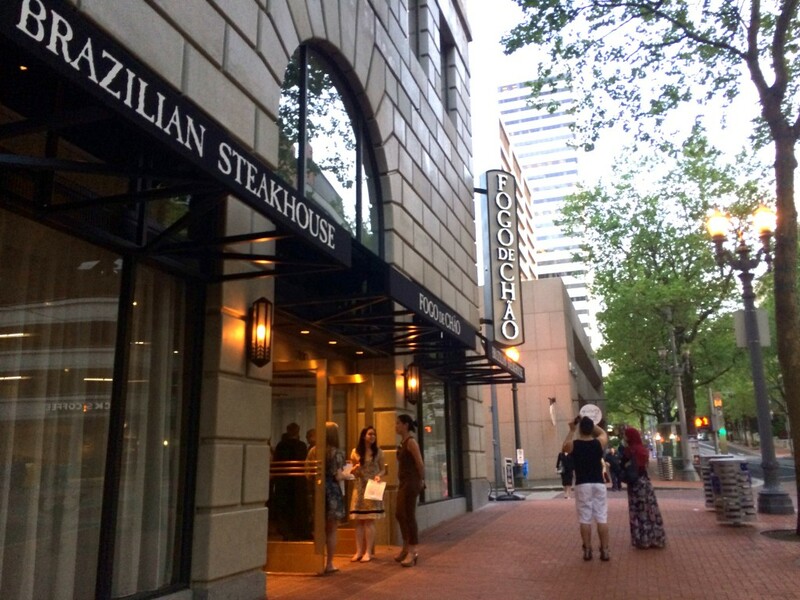 The Brazilian Steakhouse opened it’s new location in May 2014. 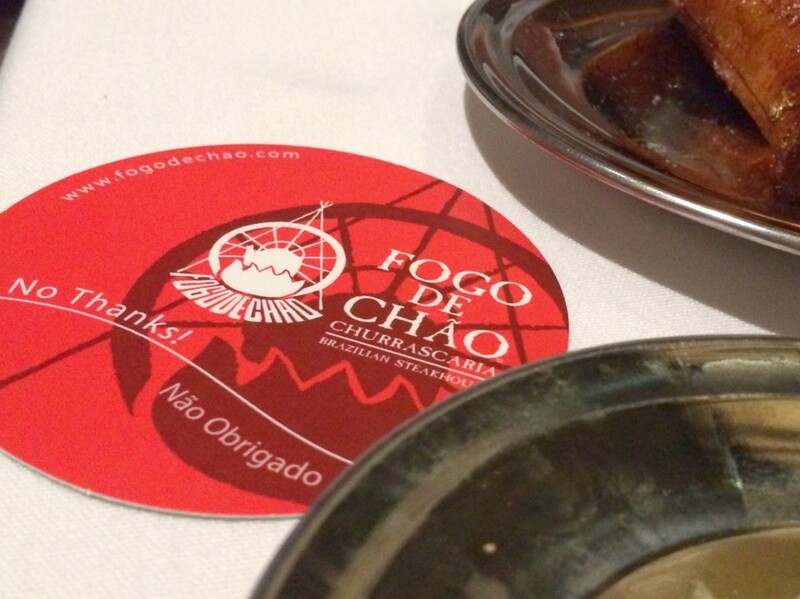 Fogo De Chao is an international chain, with locations all over the United States and in Brazil. This is the type of place I’d go for a special, fun event, like a birthday. Although the food is different, it kind of reminds me of Benihana. The restaurant has kind of a shtick, they carve all the meat tableside. It’s fun, but causes a LOT of interruptions to your conversation. My husband said he felt like he was in Vegas while we were eating. The restaurant is big, the service is bigger and the food never ends. So here’s how it works. You’re seated at a table and greeted by a server who takes your drinks orders and explains the dining experience. 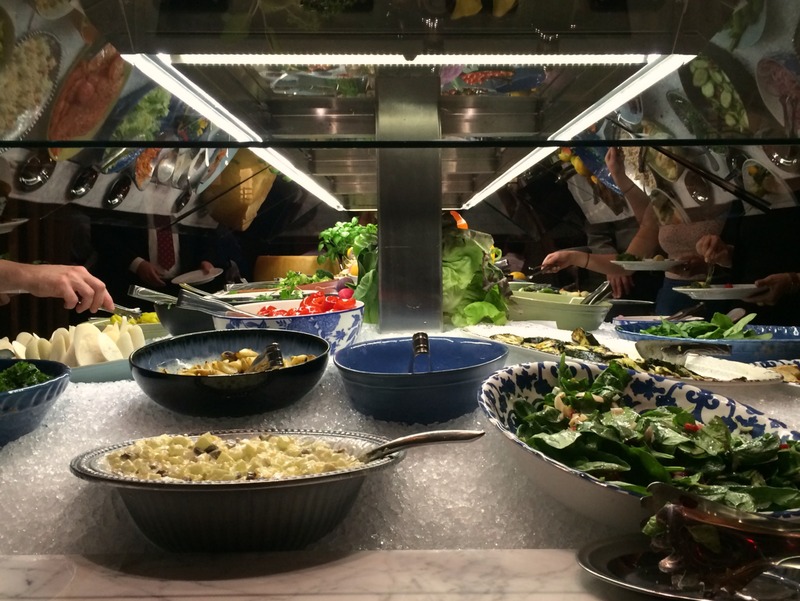 First hit the salad bar, yes, they have an actual salad bar in the middle of the restaurant. It is beautiful and well stocked with salad fixings, meats, cheeses, and other prepared dishes. Back at your table everyone has a little disk (looks like a coaster) that signals the “gaucho chefs” that you are ready for meat. And watch out because once you flip that disk, it’s on! Immediately, 4-5 chefs were lined up with their meat on skewers, ready to serve. 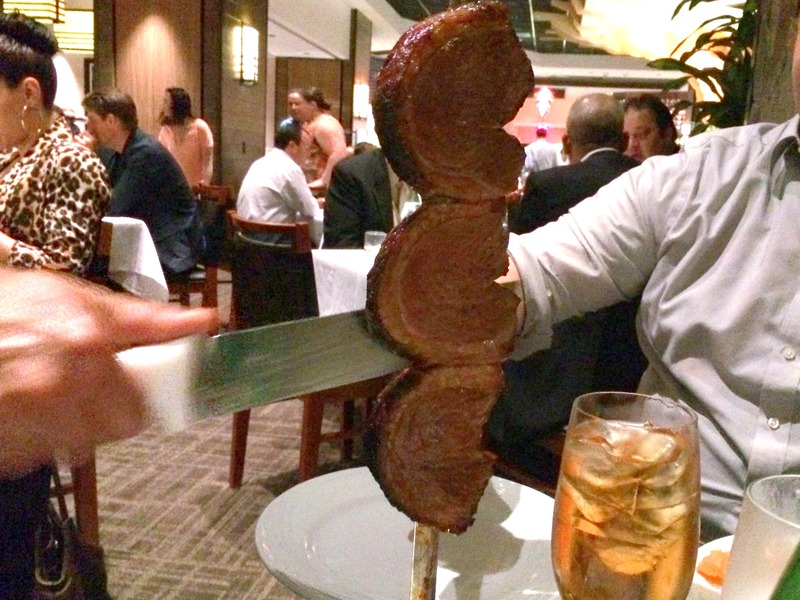 There are 16 different cuts of meat to choose from, everything from filet mignon to chicken to pork to sausage. I finally got my card turned back over so I could eat. And it was great. I’m a meat lover so I was pretty happy. The beef was especially fantastic. 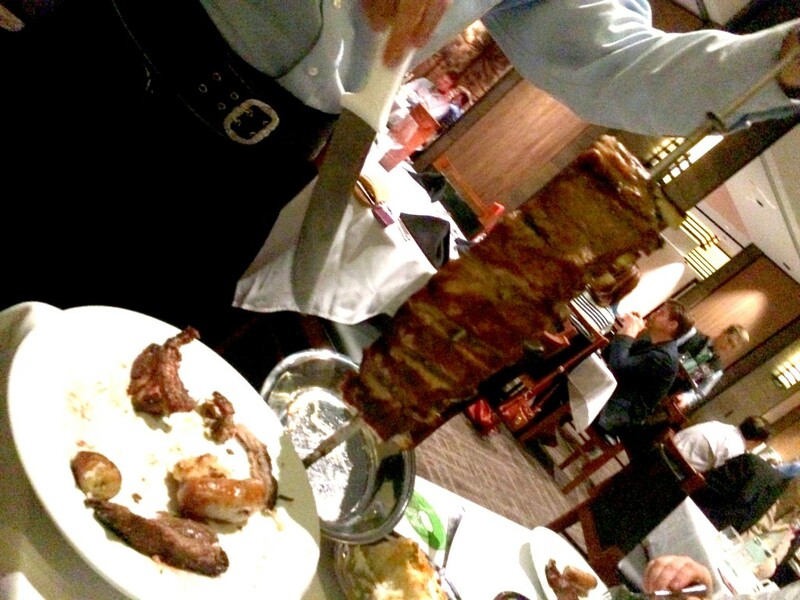 Since the chefs have such large cuts on their skewers they can cut you a slice at the “doneness” (is that a word?) that you prefer, i.e medium, or rare. But once the meat arrives, you’re still not done. The sides are next. 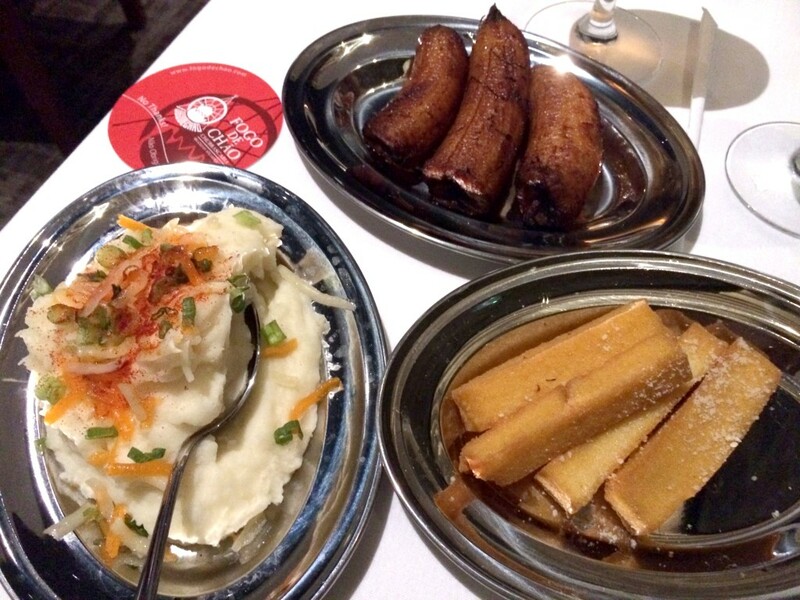 Mashed potatoes, fried bananas, fried polenta and cheese bread are delivered to your table. The sides were fantastic. I loved the potatoes and the cheese bread, and the bananas were much better than I expected with a sugary crunch around the outside. At the end of the meal they offered us a large list of desserts that included cheesecake, flan, a mousse, and a key lime pie, but we opted to share a Molten Chocolate Cake. The whole evening was delightful, we left absolutely stuffed, but had a fun time. One funny note about the service, it was perhaps too enthusiastic? Some of the gauchos seemed so disappointed when we turned down their meat. I felt a little bad saying no but I was holding out for other cuts and only have so much stomach space. Maybe it was just the opening weekend excitement? 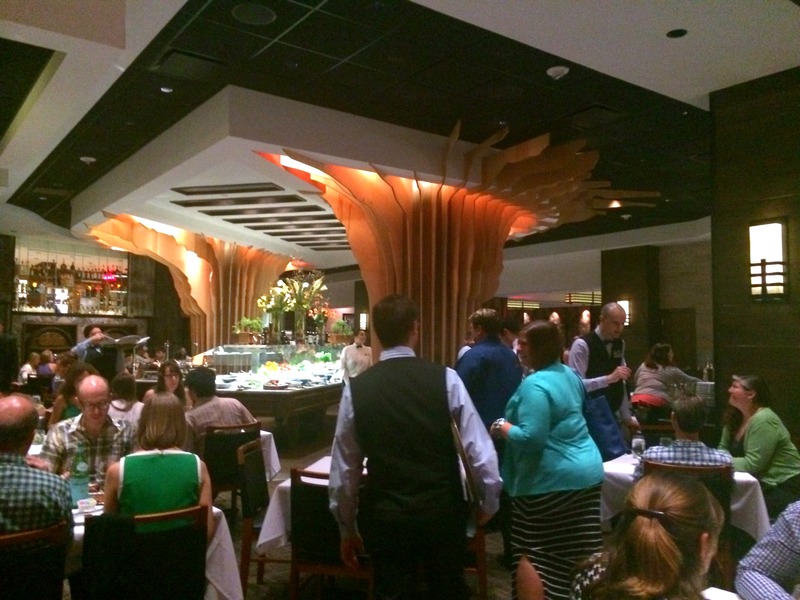 Fogo De Chao, a great place for a celebration or large group. The restaurant is huge and there are plenty of big tables. But what about price? Dinner which includes meat service, sides and salad bar is $50. At lunch it’s only $30. Of course you can add drinks, appetizers and desserts on, but the basic price is $50. It’s a fun time, I’m glad I got to go check it out. DISCLOSURE: THIS MEAL WAS PROVIDED TO ME COMPLIMENTARY, BUT ALL OPINIONS AND VIEWS ARE MY OWN.